Cadences are sets of automated workflows and communication rules to streamline customer billing, payment and collection activities. If you’re like most companies you’ve been managing Accounts Receivable with a combination of aging reports, spreadsheets and a lot of manual labor. While accounting systems show you what’s past due, all the effort of determining what needs your attention and what needs to happen is left to you. Armatic’s Cadence system allows you to automate all or some of these steps with fully customizable workflows and communication rules. You can utilize multiple communication channels (email, SMS, letter or phone), copy other team members and even control what communication is sent automatically and which ones require approval. Cadences maximize collections effectiveness and efficiency, by ensuring every customer/invoice receives the optimal level of attention while your team is empowered to do more impactful work. Each cadence is a set of rules that can be assigned at the customer or invoice level. This provides the ability to create specific communication rules to manage different customer types, products, teams, relationships, etc. Once a cadence is assigned all cadence steps are scheduled (and can be viewed in the "To-do List". Once an invoice is fully paid, it will be removed from a cadence automatically and all unsent steps will be cancelled. There are a handful of cadences already created to give you some ideas but, they are also designed to be used "as-is" if you like. To help you get a feel for how cadences work, we recommend creating a new one by selecting "New Cadence" in the upper right corner. Provide both a name and a description for your cadence, using "Test" for both is fine (this can be changed later) then save it. Click on the name of the cadence to enter the cadence settings. When you enter a cadence without any existing steps, a popup will appear to create a step. A step in a cadence is a communication or reminder rule. The "Condition" is the trigger for the rule. Conditions can be based on customer, invoice, payment statuses or a point in time. Some of the most frequently used conditions trigger communication when an invoice is created, when an invoice is past due, when a payment is made/declined as well as sending statements on a specific day of the month. Phone call - In a cadence a "Phone call" is a reminder to call the customer that will be displayed in the "To Do" list. The call task can be completed using our integrated VOIP system, like Armatic's SMS usage, the caller ID number can be customized and VOIP minutes can be included based on your Armatic plan. Charges for additional VOIP minutes will be deducted from your prepaid Armatic balance. Internal reminder - This option allows you to send an email to any email address you like. This is especially for sending inter-company notifications regarding the status of a customer or invoice. Once you selected the condition, type of communication and save the step it will now show in the cadence overview on the left. Settings and content for the selected step will appear on the right side on the screen. The settings available for each step will vary based on the type of condition and communication channel. For "Email" or "Internal Reminder" steps, you can copy other team members or email accounts on the communication. Selecting the option to "Copy to company email" will CC the email address listed as the "Accounting Email" under Company Profile. Selecting the option to copy the "Owner", "Sales Rep" or "Account Manager" will send an email to the user listed for as either the Owner, Sales Rep, or Account Manager for the customer the step was triggered for. 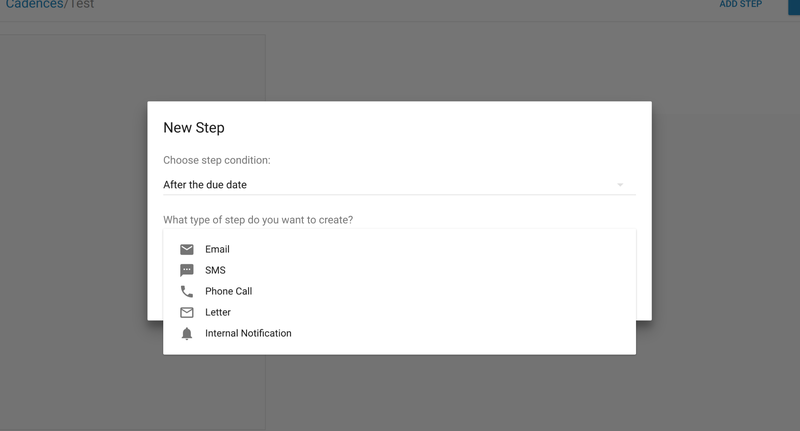 Every step has the option to be sent automatically, Selecting the option to "Send this reminder automatically" means, as soon as the condition is met, that step in the cadence will be sent in the next delivery window (delivery windows can be configured here). Not selecting this option means that this step will need to be approved manually in order to be sent. Steps that require your approval will show as "Pending" in the "To do" list. For "Email" and "Letter" steps, there will be an option to "Attach invoice PDF". Selecting this option will attach the invoice to the email or, in the case of a letter, print the invoice PDF on the back of the first page. 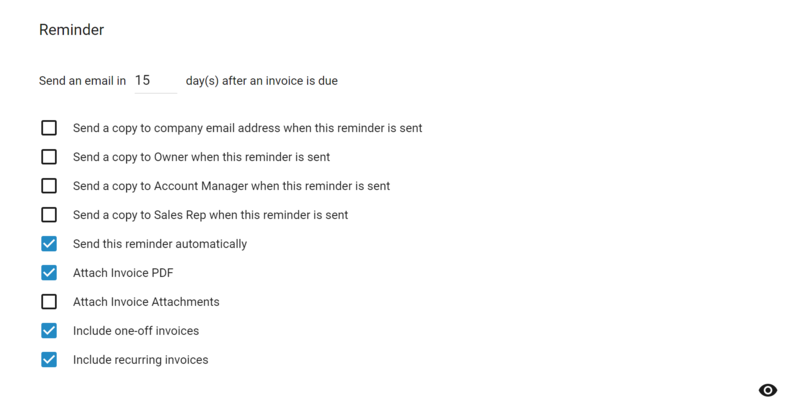 The option to "Attach invoice attachments" is also available for Email steps. If a file is attached to an invoice in Armatic, thi attached file can also be sent via the cadence as an attachment to the email. To attach a file to an invoice, click the invoice number in Armatic and scroll down to te "Document" section of the invoice and select "Attach New Document"
Armatic can pull invoices in from our accounting system as well as create invoices invoices that are created by our "Subscription Module" are "Recurring Invoices" all other invoices are considered "One-off Invoices" Typically, you will want to keep both of these options selected. 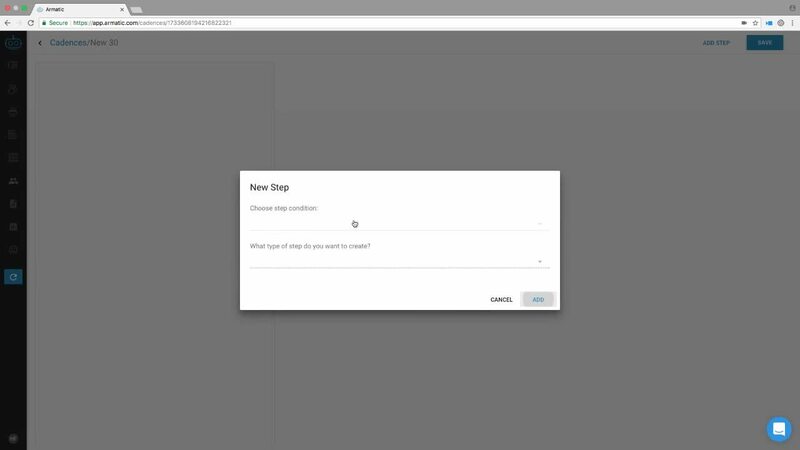 Deselecting one, allows you to create steps that will occur for only subscription invoices or only for non-subscription invoices. Most conditions have the option to choose the number of days before or after an event to trigger the step. For example, you can create a step to send a past due notice 5, 15 and/or 45 days after an invoice is past due. You can enter up to three digits in this field. Statements have some unique settings because they are generated at the account level. When you create a statement you can choose to "Not send if the customer's balance is cleared", which will not send a statement to customers assigned to the cadence if the customer does not have balance. You can also limit the invoices included on the statement to "only include invoices created in the last __ days", This option will exclude invoices created outside the number of days selected. Statements can be sent by email (as an attachment) or as a letter. Below the settings on the right side of the page is where the content for each step of the cadence can be created/edited. For emails, enter the "Subject" of the email then the content below. You can use the editor to customize the appearance of the communication or you can switch to HTML mode by selecting the "</>" icon from the editor menu at the top. 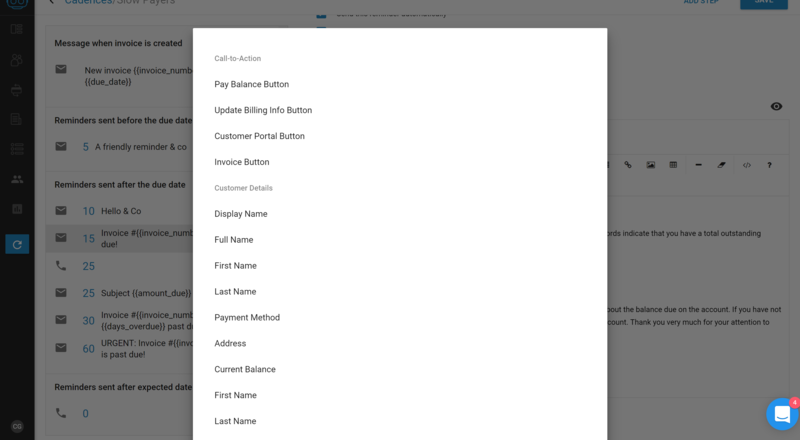 For information specific to the customer, balance, invoice ext, you would use a "Placeholder". To access the placeholder list, select the "+" icon in the editor menu. Placeholders will pull in specific information to the communication, allowing you to personalize content as well as a call to action. Depending on the condition used, available placeholders can change (i.e. 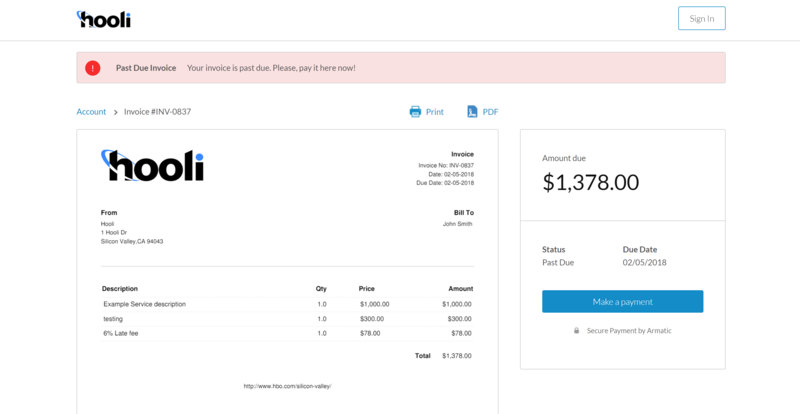 the Payment Receipt condition can not pull in Invoice number). Call-to-Actions allow you to direct your customers to take a specific action like "Pay your invoice", "Pay your balance" or "update the payment method on file" right from the communication they receive. To add a call to action, simply select the "+" icon to access the placeholder menu, then select the appropriate call to action. 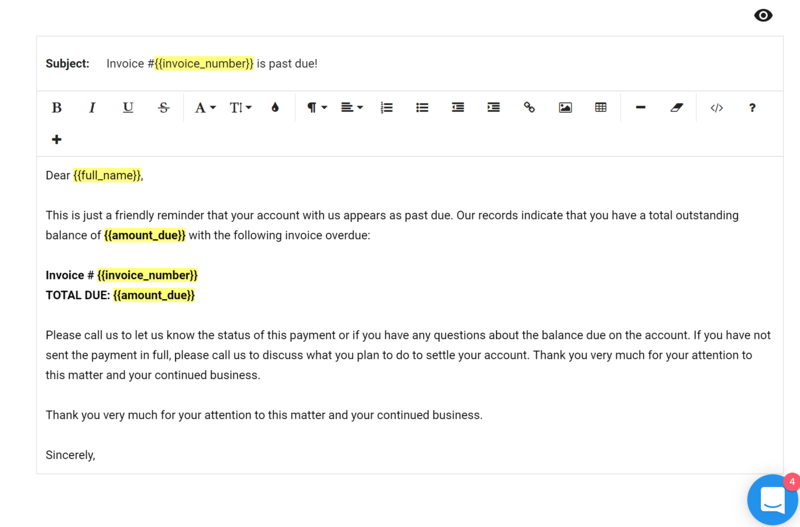 Directs customers to an online version of the invoice that triggered the reminder. Integrated payment options are available to accept payment for this invoice. Connect a payment processor under Account > Payments. Directs customers to a summary of open invoices, with the ability to make a payment for all of them at once or individually. Directs customers to update the payment method they have on file. This can be especially useful for failed auto payment cleanup. Directs customers to login to their customer portal. Customers that have previously been invited to the portal can simply login with the password they created. Customers that have not been previously invited will need to "Request Access" and enter the email address you have on file for them. Don't try to make the perfect cadence from day one. 5-10 steps at the most will be sufficient to start sending out reminders, you can then add more, remove or adjust steps based on feedback. Don't use the "Send the reminder automatically setting" for a period of time. You will then be able to preview all communication that will be sent in the "To-Do" list. You can then approve them as needed or edit the cadence to enable automatic sending of some or all of the steps. Once the cadence complete, you will simply assign it to the customers or invoices that should receive those rules. 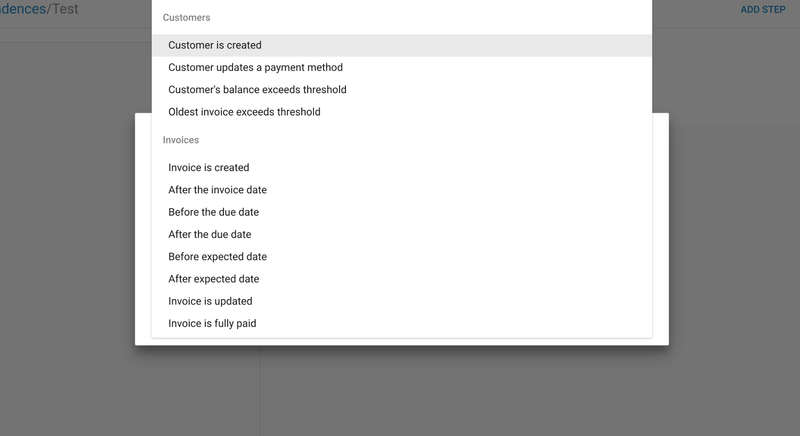 Select the Customers tab from the left navigation to view your customers. You can then individually assign customers to a cadence by selecting the "Action Menu" on the right, them "Change Cadence"
This can also be done a page at a time using the "Batch Actions" menu on the top left of the page.